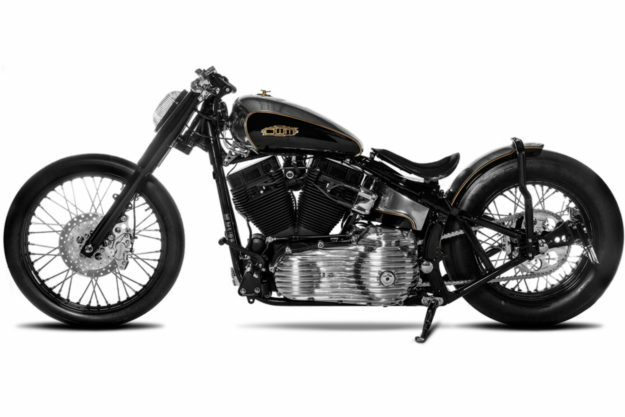 When Harley-Davidson celebrated its 115th anniversary with a party in Prague earlier this year, it invited a select few builders to present a custom Harley each. And with a remarkable three AMD World Championship podiums to his name, Julian von Oheimb was an obvious inclusion. 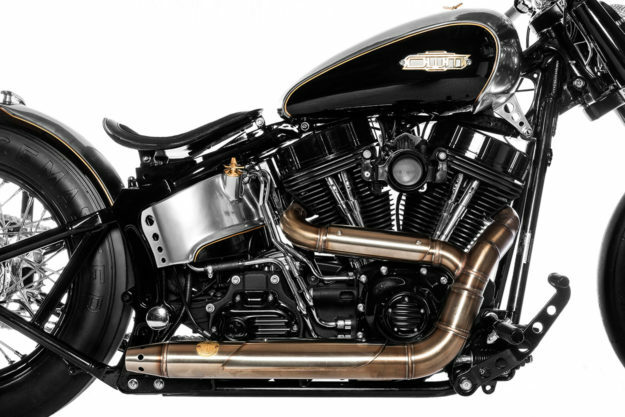 The German builder—who operates as One Way Machine—has a knack for turning Harleys into subtle, tasteful customs, and his anniversary build is a stunning example. 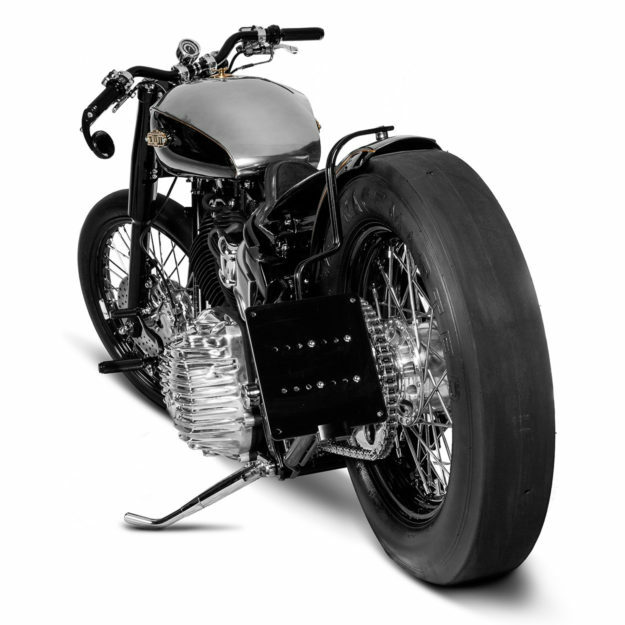 Called Quartermile, it’s a dark and minimal bobber imbued with drag bike style. Despite the low-slung ergonomics and race slicks, it’s not actually a race bike. 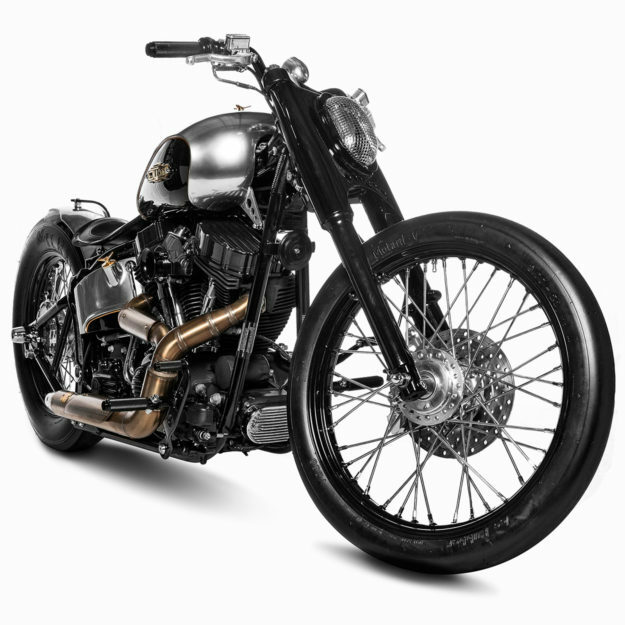 The visual cues come from an idea Julian’s had buzzing around in his head for years—since he fell in love with a Billy Lane Knucklehead with slicks. It’s also a bike that Julian didn’t have to build. 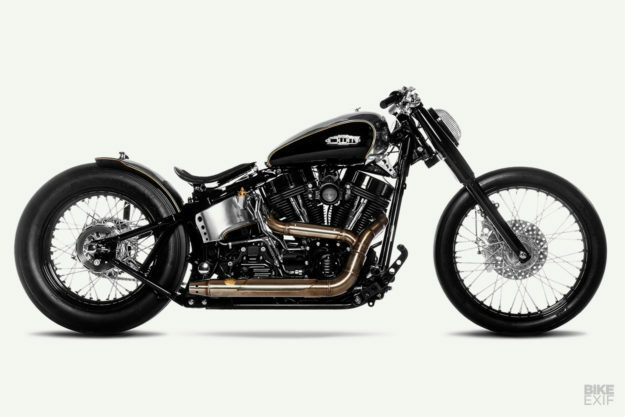 Harley-Davidson gave all the invitees the choice of bringing an existing bike, or building something fresh. Even though the show was less than four months away (a OWM bike usually takes well over a year to deliver), Julian was dead set on creating something new. All he needed was a suitable donor. Luckily, Julian’s dad had a 2007 Heritage Softail, imported from the US years before. The two of them were scheduled to go on a road trip across the Midwest around the time of the Harley event, but had to postpone due to dad’s health. The focus went onto Prague. With the base bike decided, it was time to refine the design. Julian dug through his desk drawers and pulled out some old drag bike concepts he’d sketched. 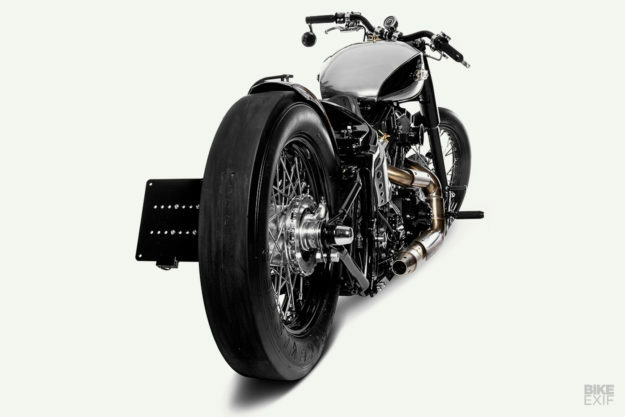 He cherry-picked his favorite design cues, then adapted them to work with a Heritage Softail—on the street, rather than the drag strip. Julian started by stripping the Softail down, then cleaned up the frame and swing arm. All unnecessary tabs were stripped off, along with the fender struts. Julian lowered the bike too, using a lowering kit that works with the stock suspension at both ends. Rounding out the rolling chassis is a pair of TTS rims: 2.15 x 21 in front, and 3.5 x 18 out back. 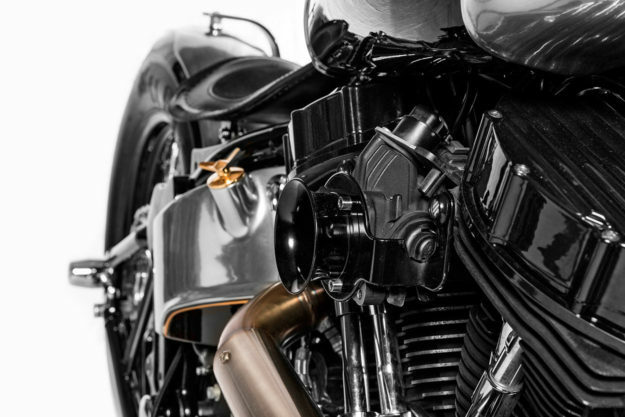 The front slick is from Vee Rubber, with an M&H Racemaster at the rear. Julian’s also converted the Softail from belt to chain, and installed new brakes: a Beringer inboard setup at the back, with a Beringer disc up front. 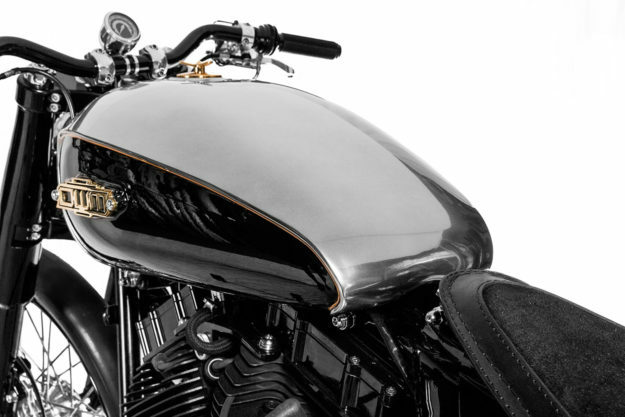 Julian always gets the lines of the bodywork to look just ‘right.’ This time, he’s taken a Sportster Custom fuel tank, then edited it to fit the Softail’s frame. He’s modified the oil tank too, and topped both off with caps from KustomTech. Items like the rear fender, fender bracket, license plate bracket, battery cover and fork shrouds were all made by hand, from scratch. 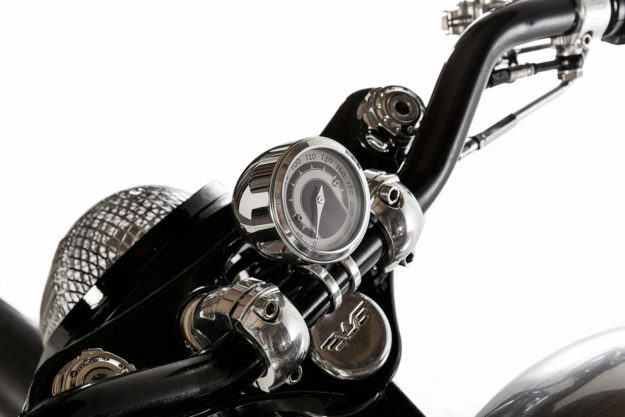 Finer details include a set of One Way Machine handlebars, Beringer controls and a Motogadget MST speedo. Julian also modified the stock foot controls a little, and built one of his signature headlight installations. 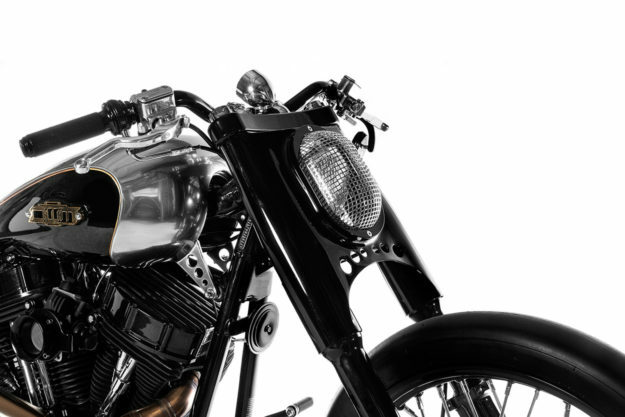 BK-Lack GmbH and Coco Breezé Art Works were called in to paint the bike. It’s now sporting a sublime silver and black scheme, punctuated with discreet flashes of gold—like the elegant tank badges). Spirit Leather jumped in to upholster the bare-bones perch. After H-D’s 115th in Prague, the bike went off to the Custom Summer Days in Mannheim. It stole the show, quite literally, with a ‘Best of Show’ award. Right after that, Julian handed it over to its new owner—a businessman from the Lake Constance Region who already owns two OWM bikes. We’d say he’s accomplished that, wouldn’t you?